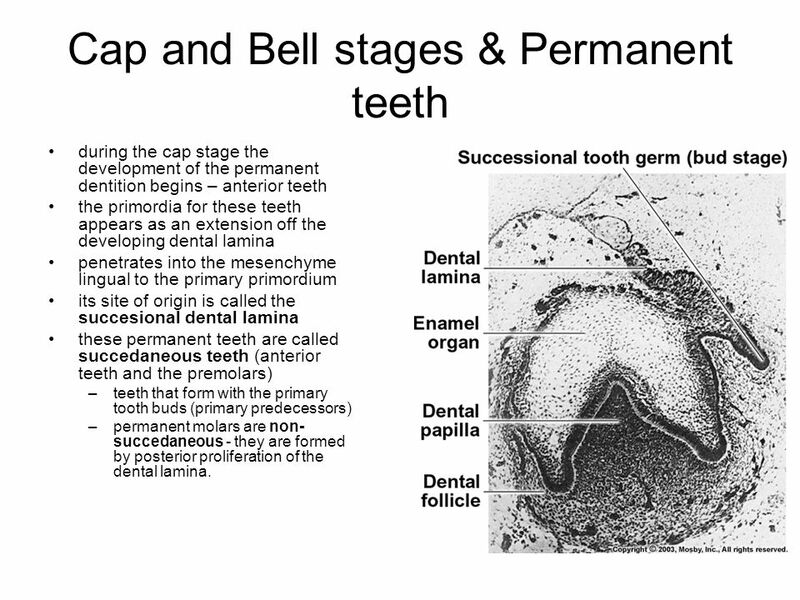 Summary: Difference Between Cap and Bell Stage is that unequal growth in different parts of the tooth bud leads to the cap stage. While as the invagination of the epithelium deepens and its margins continue to grow, the enamel organ assumes a bell shape. As the tooth bud continues to proliferate, it does not expand uniformly into a larger sphere. Instead, unequal growth in different parts of the tooth bud leads to the cap stage, which is characterized by a shallow invagination on the deep surface of the bud. As the invagination of the epithelium deepens and its margins continue to grow, the enamel organ assumes a bell shape. In the bell stage crown shape is determined. It was thought that the shape of the crown is due to the pressure exerted by the growing dental papilla cells on the inner enamel epithelium. This pressure however was shown to be opposed equally by the pressure exerted by the fluid present in the stellate reticulum. The folding of enamel organ to cause different crown shapes is shown to be due to differential rates of mitosis and differences in cell differentiation time. Cells begin to differentiate only when cells cease to divide. The inner enamel epithelial cells which lie in the future cusp tip or incisor region stop dividing earlier and begin to differentiate first. The pressure exerted by the continuous cell division on these differentiating cells from other areas of the enamel organ cause these cells to be pushed out into the enamel organ in the form of a cusp tip. The cells in another future cusp area begin to differentiate, and by a similar process results in a cusp tip form. The area between two cusp tips, i.e. the cuspal slopes extent and therefore of cusp height are due to cell proliferation and differentiation occurring gradually from cusp tips to the depth of the sulcus. Cell differentiation also proceeds gradually cervically, those at the cervix are last to differentiate. The determination of crown shape (tooth morphogenesis) is under the control of genes and their signaling molecules and growth factors. These have been dealt in detail in the section on molecular insights in tooth morphogenesis. Four different types of epithelial cells can be distinguished on light microscopic examination of the bell stage of the enamel organ. The cells form the inner enamel epithelium, the stratum intermedium, the stellate reticulum, and the outer enamel epithelium. The junction between inner and outer enamel epithelium is called cervical loop and it is an area of intense mitotic activity.